In the movie thalapathy, Surya (Rajni) was the right hand of Deva (Mammooty). Mammooty derived his strength because of Surya's presence in his team. 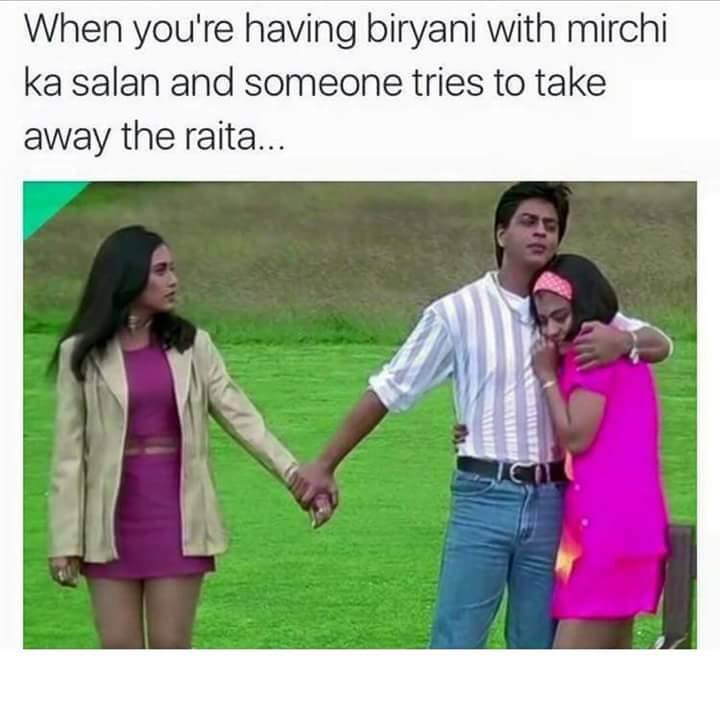 In the case of Biriyani, raitha plays a similar role (the image talks about mirchi ka salan). I have seen some people who do not eat Raitha because they are allergic to curd and onion. But those who have tasted Biriyani with raitha would know that it increases the taste of biriyani multi-fold. I hate it when someone takes Raitha from my plate. I would even part with kuska from my plate; but when someone takes raitha, I would even bite their hands. Back in college we had a friend Ravi who would steal side dishes from others' plates. He would also do gross stuff on his plate. As soon as he flicks raitha from our plates and transports them to his plate, he would immediately spit on his plate. This would stop anyone from retrieving their side dishes form his plate. This was going on for a long time. Finally we decided to put an end to his plans. One day when he did his usual flick-spit trick, we all ganged up together and spat together in his plate. It was a mass phlegm movement. He did not expect that at all. He stopped taking raitha from our plate that day. Why did I post this? If you ever try to flick raitha from my plate, you should be ready to face the phlegm attack from me.